During 25 – 27 October OpenMinTeD participated in the FORCE2017 Research Communication and e-Scholarship conference that brings together a diverse group of people interested in changing the way in which scholarly and scientific information is communicated and shared. On Friday October 27th the OpenMinTeD partners held two workshops, one on “How to improve interoperability across publisher platforms to support text and data mining” and another one on “Enhancing the real impact of scholarly publications through text and data mining”. At the first workshop the Open University partners from the CORE project presented on the work they have done on the Publisher Connector. 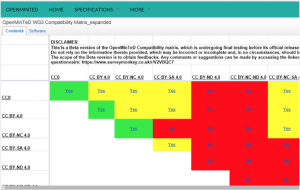 This involved surveying the publishers on their machine accessibility interfaces of accessing Open Access content, the creation of the Publisher Connector, a tool that harvests Open Access content from publisher systems and exposes them via the ResourceSync protocol, and the technical expertise directory, where documentation is provided on how harvesting from publisher platforms can be achieved. The FORCE conferences are traditionally highly attended by publishers and as it was anticipated half the participants in the workshop were publishers. Since it is to the interest of the OpenMinTeD partners to work with the publishers in this task, their presence was welcomed. Our work received attention during the event and some positive collaborations will start soon after. 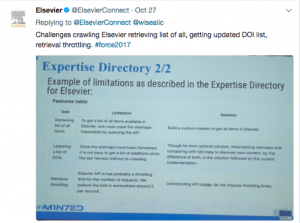 Screenshot of the Elsevier limitations on applying text and data mining for Open Access content tweeted by Elsevier. Our second workshop focused on the project’s TDM Scholarly Communication Use Cases, which extend from research analytics and recommender systems to information extraction for health state modelling. The participating speakers were Natalia Manola (Athena Research and Innovation Centre, University of Athens), Sophia Ananiadou (National Centre for Text Mining, University of Manchester), Petr Knoth (CORE, Knowledge Media institute, The Open University), Mappet Walker (Frontiers) and Androniki Pavlidou (Athens Research and Innovation Centre, University of Athens). In the end, Giulia Dore (University of Glasgow) presented on the project’s progress on the license standardisation and interoperability and demonstrated the Compatibility Matrix (beta version URL), a tool to provide guidance to users wishing to undertake TDM activities and overcome the ambiguity of the current setting. Stay updated with the progress of the OpenMinTeD project subscribe to our newsletter, read the news in this blog and follow us on social media.